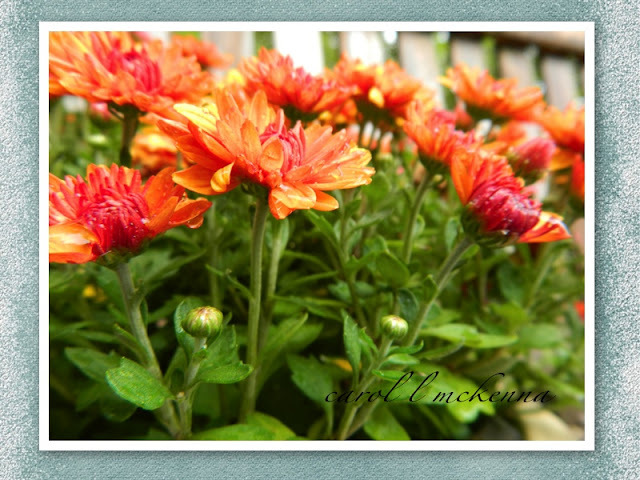 MONDAY'S POST ~ Some changing going on here. Now have photographers, artists and poets here on Monday as well. Rained for most of the weekend but was able to capture these shots in the yard in between the rains. Have pots of Mums and some Clematis growing that was planted at the end of August. Felt good to grab those moments of 'outdoor' creativity. Confused ~ Because some of these blogs are 'across the pond', they are a day ahead of us and thus need to add them to my Monday post. They are great blogs but sometimes days get confused. Hope you enjoy the visuals and haiku. Enjoy whatever day it might be where you are. Each day is a gift to my creative spirit. Yes.....each day is a gift! Lovely post! Thank you Carol for this wonderful haiku on waterfall ... thank you for being a participant in Carpe Diem. Hi Carol! The colors of the mums are so cheering and the seeming black and white simple and calming. Your waterfall haiku is lovely. And it matches so neatly with the photo. Love your perspcetive on the first shot...very nice macro! We had rain here also over the weekend. Getting very cold and I dread seeing Old Man Winter raise his ugly head. How does ArtMuse Dog take to the rain and cold? I am getting ready to put my warm fuzzy sheets on my bed to keep warm at night. ahhhh, rain and fall flowers, what a splendid combination! Beautiful pictures and collage ! You covered quiet a lot of memes, lol ! Always love the little sweet face of your dog ! Fabulous pics & Wonderful verses! Lovely flowers, so vibrant and graceful. The net is an awesome mind opener when we have to undersstand the different time zones and seasons. I am loving the way you are putting your Haikus on the photos! Your mums are beautiful! Pretty mums in the rain! Sometimes the harder shots to get turn out to be the best ones! Beautiful captures and lovely haiku! Pretty picture of the mums. Enjoy rains! 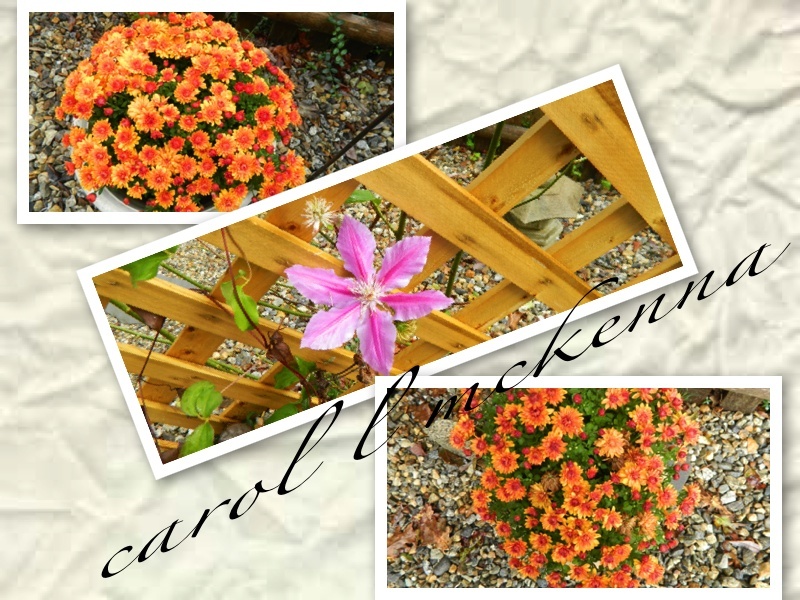 Beautiful captures, wonderful words and a lovely way to wind down my day, Carol! Thanks for sharing these with us! Have a great week! Such lovely shots. Love that bird in the rain! Beautiful pictures, such gorgeous colours! Went to a local farmer's market last week and all the mums were just begging to be planted. Fantastic colors as in your selection--especially love the shaded ones. 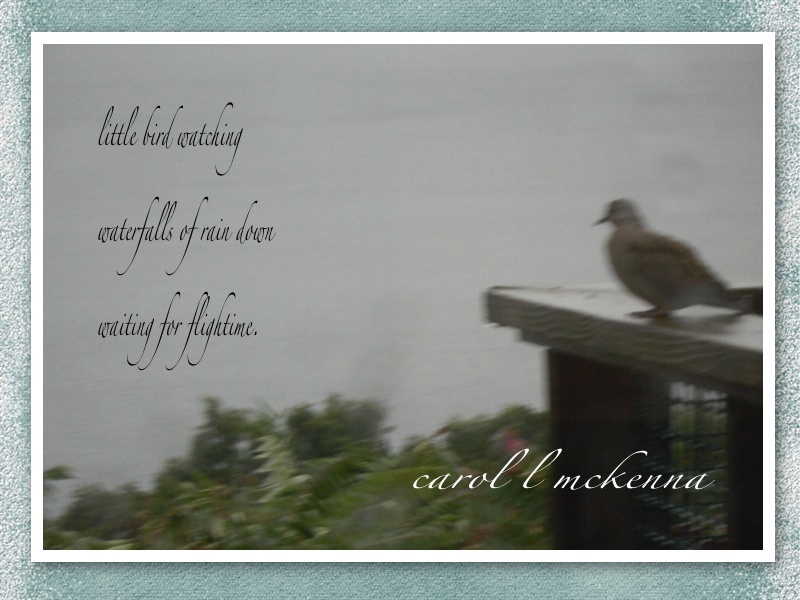 And your little study of the small bird waiting in the rain is very "atmospheric". Finally hope your Muse Dog stayed out of the mud this past weekend. Mine did not! So many of us are waiting for flight time, it seems! That close-up of your mums are amazing!! Beautiful collection of photographs with such love;y flowers. Beautiful pictures - and thanks for the quote. So true! wow i love that blurred image with the bird!